How simply wonderful and fresh Spring smells! Little Lizzy mouse is thrilled that the frost has melted and she can run around freely in the fields and forest. With her pink nose she sniffs the first daffodils of spring. Lizzy’s fur is made of high quality white alpaca. 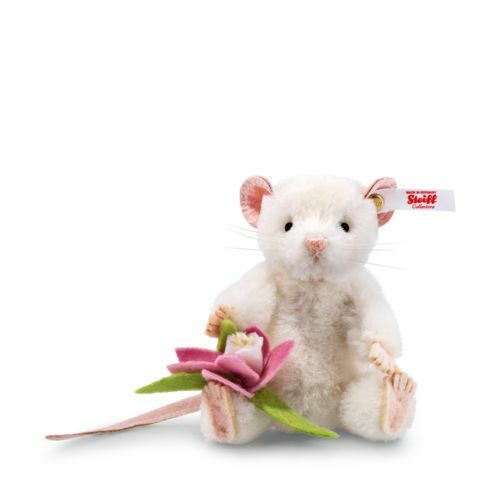 Her ears, paws and long tail are soft and lifelike, decorated in shades of pink. With her favourite flower beside her made of woolen felt, she delights knowing it will never lose its wonderful bloom. And Lizzy has another reason to be very jolly, for she is the first in a brand new mouse series!